Products with the perfect blend of style and performance. A long time favorite for landscape professionals, contractors and homeowners. Need an idea for your next landscape project? check our large collection of pictures to get you inspired! Find free brochures and downloadable information on retaining walls. Get inspired with Allan Block Design Ideas catalog and Outdoor Living Book. Need an idea for your outdoor project or have one already but not sure how it will look? Check our large collection of pictures to inspire you. 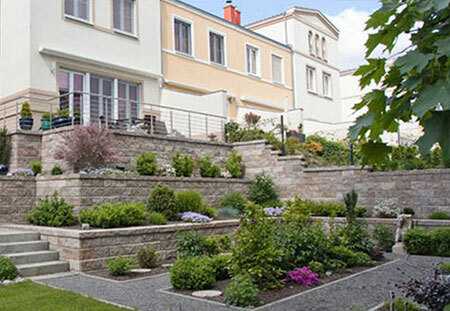 Find photos of retaining walls, stairs, terraces and more. The possibilities are endless - Take a look and see for yourself! This library of simple step-by-step videos on the plan, design and build process for retaining wall. Step by Step installation instructions for retainingw alls up to 1,80 meter tall.